Twitscoop, a real-time visualization tool that lets you see hot trends and buzz on Twitter, is getting a makeover and adding several useful features that may help you “mine the thought stream.” These features will officially roll out at 8 AM PST. Twitscoop’s algorithm identifies tags and keywords in the Twitter stream and then ranks them by how frequently they appear versus normal usage. Twitscoop detects growing trends in real-time, identifies breaking news and then monitors specific keywords along with graphs that display the activity for any given word on twitter. The results are also displayed in a “Tag Cloud,” where the hotter tags are presented in a bigger front. Besides showing the trending topics on Twitter, Twitscoop, which provides a service similar to Tweetag, Tweetmeme, and Twitturly, also lets you search Twitter messages for trending topics. Twitscoop is becoming a full-fledged Twitter service, adding oAuth to let you sign in with your Twitter account and tweet from the site without leaving the page. Additionally, you will be able shorten urls and tweet searches from the site. The new additions to Twitscoop’s roster of features include a new and improved real-time tracking code and a redesign of the user interface. 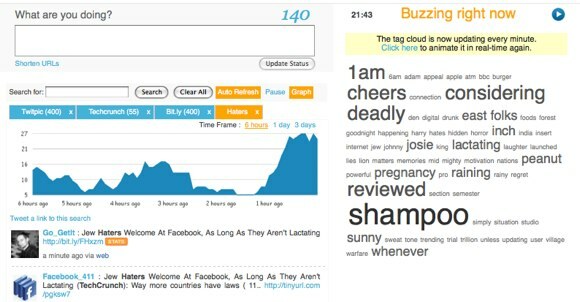 The right side of Twitscoop’s homepage displays in real-time the words which are “buzzing” right now on Twitter. This tag cloud is updated automatically, with tags continuously appearing, growing, shrinking and finally vanishing. When you hover over a tag, a popup window will appear, displaying the latest related tweets about the tag. If you click on the tag, you open up a search tab within the site which will display all the related tweets along with a custom graph showing the tags’ activity over the past few hours or days. The graph is an interesting feature that isn’t available on most of Twitscoop’s competitors and helps you understand the timeline of a trending topic. On the left side of the homepage, Twitscoop shows general “trends” detected on Twitter. Clicking on any hot trend will open a tab with a snapshot of the corresponding search results by time frame, from 6 hours to 1 day to 3 days. I’m a fan of the way Twitscoop saves multiple searches in different tabs within the site. It makes it very easy to jump from one search to another without having to conduct the search over again. Unlike competitor Tweetmeme, which measures trends and hot topics by links and is also adding innovative features, Twitscoop measure trends by keyword. Tweetag, another tag-based search engine for Twitter that also uses a tag cloud to show results, is also useful but doesn’t include the interactive graphs and in-depth features of Twitscoop. Twitter, which acquired Summize, whose technology currently powers Twitter Search, also features trending topics but doesn’t go into the same depth as Twitscoop either. Twitscoop has lofty ambitions—the site hopes to not only be a go-to application to measure trends and buzz on Twitter, but also wants to be a major Twitter client, albeit a Web-based one. This field is packed with many worthy competitors including Seesmic Desktop, Tweetie, Tweetdeck, Twitterific, and Nambu. Although it’s doubtful that Twitscoop will be able to take a large piece of the Twitter client pie, the site provides a useful way to find out what’s happening on Twitter that’s buzzworthy in real-time.